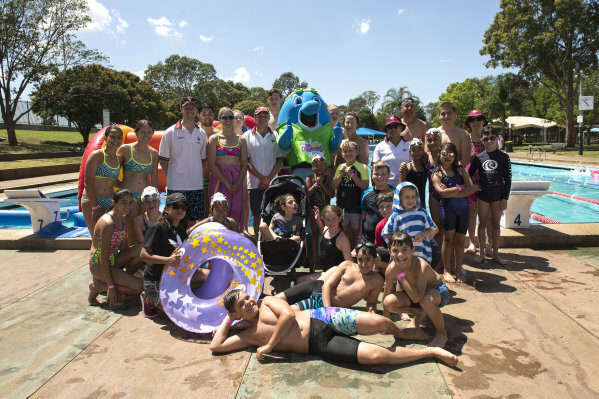 Issue 7, 2018/2019 - Whales Tales Newsletter | Merrylands A.S.C. Inc.
We hope you enjoyed the Back to Merrylands Day celebrations last Saturday. Thank you to everyone who attended the day including our Life Members, past and current members, families & friends. Unfortunately Ms Julia Finn MP for Granville was unable to attend and had sent her apologies for this. Thanks also to Jann Fathers who visited and helped out refereeing club races. The celebrations and events held on the day were organised by the club and they could not have happened without a big effort by the Committee members. Thank you to everyone who helped on the day with activities such as cooking the bbq breakfast, running the pool activities, organising and picking up the cake and taking photos. The club hired an inflatable for the day and it was enjoyed by everyone who attempted to become a Merrylands Ninja Warrior. Additional life guards to man the inflatable during the day were provided by council. It was great to host a special visit by Yampu, the Optus Junior Dolphin, I hear Yampu made a great impression on all the kids, young and not so young! More details for these and other events can be found in the 50th Anniversary section of the website. We will be announcing our Club Captains for the 2018/2019 season this morning. Thank you to those who have taken and sold chocolates for our recent fundraising activity. Please return funds to Vicki & Hayley Baker by the end of week 8, Saturday 24th November 2018. The postponed 100 metre Backstroke Championship races will be held next Saturday (24th November, 2018) in addition to the 200 metre Individual Medley Open Championship. The 400 metre event has been removed from the program to provide time for the two championship events to be held. More details are available on the club website (online entries). The Parramatta Inter-Club Cup will be held at Granville Pool next Saturday (24th November, 2018). The Competition Committee will advise all swimmers who have been selected to represent our club at this meet. Cost for each swimmer is $10 which includes pool entry, event entries and a sausage sandwich. Entry to the pool for spectators is free. If you need to purchase club uniform items before this meet please see the club Property Officer (Margaret Edwards) & the club website to place an order. Do you know who your office bearers and committee members for this season are? In addition these members hold a number of other positions and perform roles that ensure the smooth running of our club. Thank you to these members for volunteering for these roles and the time they provide to the club. 7 of these members are life members of the club and they have dedicated many years of service to the club. There are lots of jobs that need to be done on a Saturday morning. Are you interested in learning how to do any of the following: Chief Time Keeper, Marshal, Starter, Recorder, Timing System Operator, Computer Operator? If so, please speak to Graham. The more people involved in these roles the smoother club races can run and also cover times when our officials are not available. As you can see we do have a couple of positions vacant on the committee and we are looking to fill these roles. Previous experience in roles and committee positions are not required. We would love to have a broad cross section of our members volunteering to help steer the direction of the club as we enter the next 50 years. To learn more about the club and it’s activities club members can log on to the club website and read the latest Annual Report (2017/2018 season). Congratulations to Matthew Vicic on his first open water swim in the 2.5k race last Sunday. Great effort Matthew and with a big smile at the finish. Good luck to Michael Evans, Steven Nguyen, Alison Sakurovs & Reece Tomkinson who are competing at the Area Championships being held at SOPAC this weekend. May the whale be with you all. 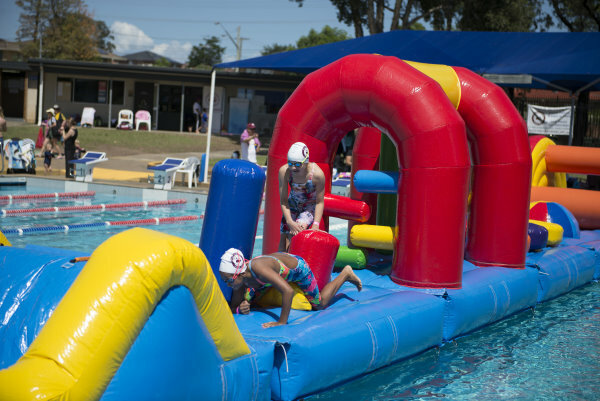 The club hired an inflatable for the day and it was enjoyed by everyone who attempted to become a Merrylands Ninja Warrior.